BOSSY BETTY: Your First Monday Morning Flowers of Spring! Betty's People all get flowers to start the week. These beauties are the perfect way to start the first full week of Spring. When I bought them, they were closed up, but one day in water and here they are in all their glory. Hope you have all you need to bloom today! Beautiful! One of my favorite parts of spring. I can't wait to see them all blooming! What a beautiful punch of posies!!! Happy Spring, Betty! Love these daffodils and the quote from Twain! So glad spring is finally here. These are stunning, stunning, stunning. Ah, the hope of spring. Dear me, how I love Mark Twain. He is on my list of folks I want to meet the day I hopefully make my way to Heaven. 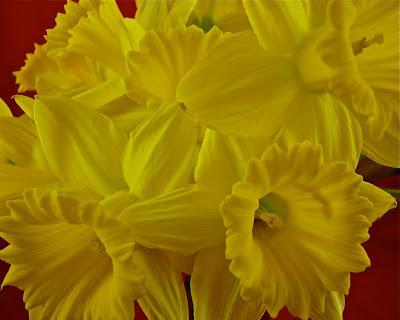 I love daffodils, these are beautiful. It sounds like you write lovely poetry. Thanks for joining my blog. Very lovely post. I feel refreshed by the thought of flowers soon to bloom. The clouds were trying to spit snow on us this morning, so your bright yellow daffodils are a welcome spot of cheer! Thank you! Gorgeous photos/flowers!! I also love that quote! 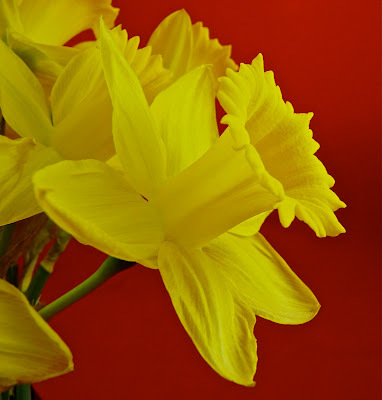 Thank you for sharing your lovely daffodils/jonquils. It was a rainy, cold day here today, so these provided the necessary bright spot. Beautiful flowers. They are starting to pop up all over, and it is nice to see. Betty, thank you for the lovely flowers. I needed that after a day of clouds and rain here in NJ. Woohoo! It's Spring! These yellow flowers are beautiful. wow. Nice spring-like pics. Helped cheer up my rainy monday. Betty, thanks for following me, I'm following you back and loving what I'm seeing here. Those are so beautiful - the flowers and the words. Thanks for a beautiful Springtime and Monday post. our rosebushes are in full bloom! i just wish i had friends close to share them with! i should take their picture and post them like you've done! I can think of no better way to start the week than with gorgeous blooms. Love the Daffodils on the red background. The only transplants that survived the trek to the High Desert are daffodils that I've had for six years. The sprouts are just about 4-6 inches above ground now. I can't wait! I, too, am so glad winter is over! Your pics are BEAUTIFUL!